Competition Clutch Domestic Stage 3 - 2250 Brass Plus/Cerametalic PONTIAC - Dezod Motorsports Inc - Home of the automotive performance enthusiast since 2002. TRANS AM GT V8 5.7 ALL ALL ALL CCI utilizes an OE style plate: Stage 3 will hold 300-350hp and Stage 4 will hold 400-425hp. 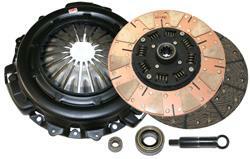 The Competition Clutch Domestic Stage 3 – 2250 Brass Plus/Cerametalic Clutch Kit is engineered to deliver a 65-70% increase in Torque capacity for heavy duty street use. This unit is designed for the cost sensitive enthusiast who still enjoys the benefit of the dissimilar materials. This combination allows superb holding power with great clutch life in moderately enthusiastic conditions.